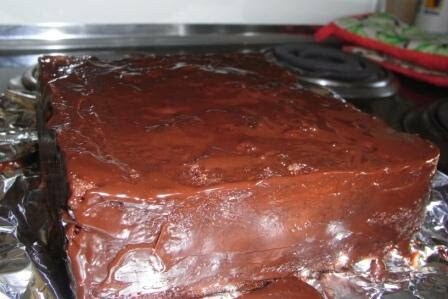 As discussed in my previous post, I haven't really had much experience working with chocolate. Given that I want Jody's birthday cake to come up looking great, I thought I'd practice by making two smaller cakes and having a play. First things first, I applied a crumb coat of ganache (bring 2/3c cream to a gentle boil, then pour over 225g of finely chopped chocolate (I used mainly dark with a little bit of milk). Let it sit for a minute then stir until smooth. There were still lumps left where I hadn't chopped the chocolate small enough so I popped it in the microwave for about 20 seconds) to both cakes. Also, prior to applying the ganache I slipped some extra alfoil under the edges of the cake to stop the cake board from getting dirtied up (baking paper would work too). Remove this after you've done all icing-type things, but before you add slabs of chocolate to the side (as per the post that will follow this one). 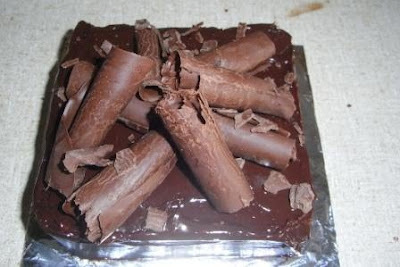 I decided that the first cake would have your classic chocolate curls, which I failed to produce for Emma and Andy, and the second cake would be a bit less traditional and more fun. So, my next step was to select my Weapon of Choice. I bought both of these because I wasn't sure what length curl I would like. I went with the smaller, metal paint scraper thingie in the end. And yes, I did procure these from the hardware store. Get your hands on some shortening. This stuff strikes fear in my heart - solid vegetable fat. But not so much as its friends sitting adjacent to it on the shelf at the supermarket - solid animal fat, and lard. 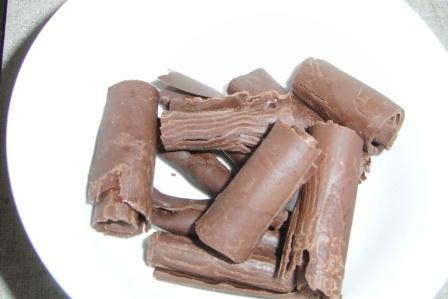 Anyway, the point is, Pioneer Woman's tutorial for chocolate curls tells you to use some to thin the chocolate down a bit and make it easier to handle. I didn't use the exact ratio - I pulled a Mum, which means "add it until it looks right". Small segue: You know what happened today? 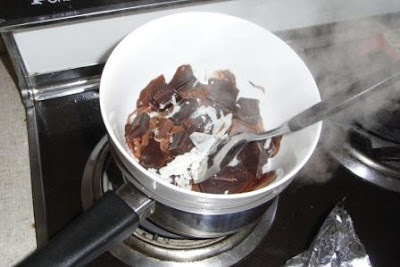 I discovered the redeeming feature of electric cooktops - you can melt chocolate on a double boiler and hold onto the bowl with a potholder with no fear at all of it catching on fire. Finally! I KNEW there must be something good about them! 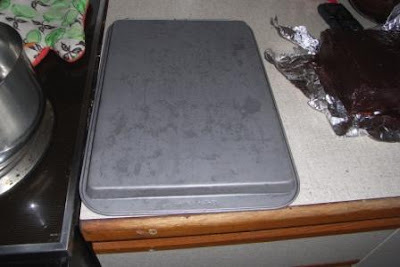 Freeze one baking tray (make sure it's clean first). Place it bottom up on the bench. 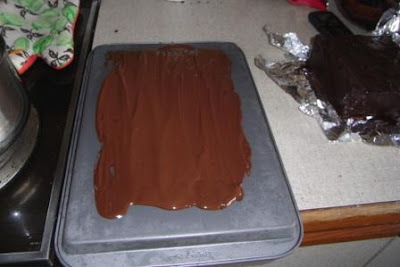 Spread the melted chocolate over the tray. I then popped the tray in the freezer to cool it a little faster (I'm impatient). I wanted it to be not quite set, so it was still soft enough to handle but hard enough to curl as I applied the scraper. And THIS is my FIRST EVER CHOCOLATE CURL!!! I'm so proud :) I'm glad I could share it with you. I'm also glad that the dirt under my fingernails is not dirt at all, but pure, unadulterated chocolate. Here's a (really badly over-exposed photo of a) bowl o' chocolate curls. 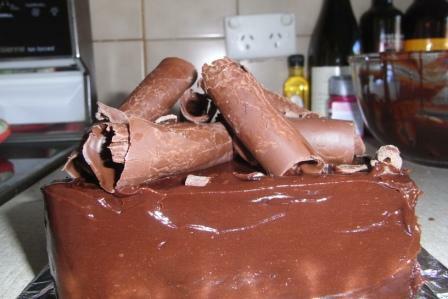 The success was a little variable because some of the chocolate didn't seem to be as set as other bits. Also, hot tip, give the blade a good wipe between each curl, otherwise it'll stick to the next curl. 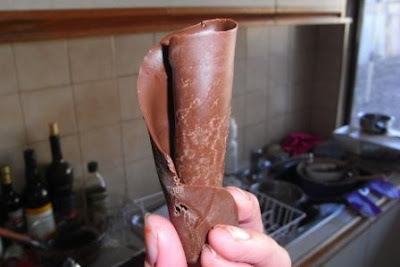 I also found that at the start of each curl, gently coaxing it to fold over with your fingers can help. 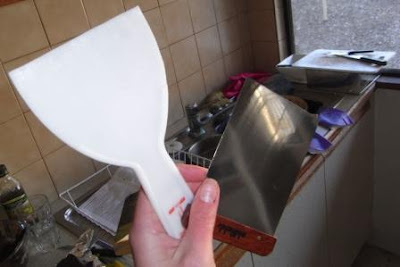 And, try to hold the blade of the paint scraper (or whatever tool you chose to use - I'm sure you could do it with the side of a metal ruler if it's all you had!) on a 45 degree angle from the tray. 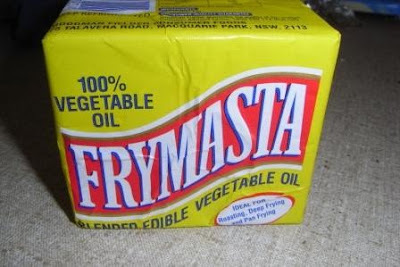 Just think of the vegetable shortening as being solidified canola oil (which I think is more or less it). Lard is definitely worse!